Made with REAL Canine Derived Bacteria! Canine L. reuteri! Your dog is an important member of your family. From puppy to senior pal, your lives and love are interwoven. For all he gives to you, his health and happiness are important priorities. One of the main keys to a healthy dog is maintaining his gastrointestinal tract. Diet, stress, or medications can upset his GI tract, resulting in discomfort and irritability. We’re pleased to introduce a new technology that can help regulate and keep your dog’s GI tract healthy! 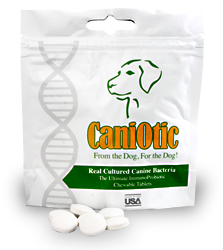 Presenting CANIOTIC, the probiotic “FROM THE DOG, FOR THE DOG!” Caniotic is a Canine Origin Bacteria technology featuring Lactobacillus reuteri. Caniotic™ is the stand alone difference in the crowded direct fed microbial field. The dogs gastrointestinal health is a challenge, easily imbalanced by stress, disease, diet, environment, or training. Caniotic™ polices the GI tract by regulating the surface bacteria with canine sourced Lactobacillus reuteri that is cultured from the dog for the dog. It has been shown to be effective in killing salmonella and other pathogens while keeping normal gut flora intact. Now there is no need to second guess your probiotics choice. CaniOtic™ provides two powerful solutions in one simple system.